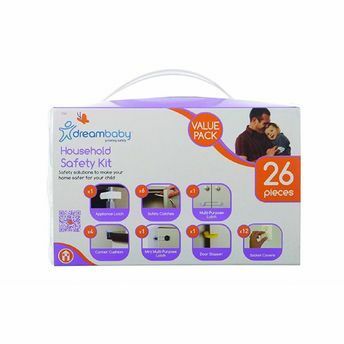 Dreambaby Home Safety Value Kits with 26-pieces contain everything you need to help make your home safe for your little ones. It includes: 6 safety catches, 12 outlet plugs, 1 multi-purpose latch, 1 mini multi-purpose latch, 4 corner cushions, 1 door stopper and 1 appliance latch. An essential item on your getting ready for baby checklist. Keep cupboards and drawers securely closed to prevent curious toddlers from slamming their fingers or accessing potentially dangerous contents. Cover dangerous electrical outlets to help protect children from electric shock. Additional Information: Dreambaby is an internationally renowned child safety brand available in more than 100 countries. They offer an extensive range of products that are specifically designed to provide parents and carers with modern home safety solutions that make child safety around the house simpler.